Product Note: includes 3 promo cards! The Card Coffin is an all-in-one accessory for storing, transporting and separating collectible card game decks and systems. Larger than other deck boxes, the Card Coffin includes a plastic insert which separates the container into four distinct compartments customized for the components of any collectible card game system: a large, center compartment for a main playing deck of up to 80 cards in protective sleeves, two narrower compartments for side boards or cards-to-trade, and a compartment for counters or dice. 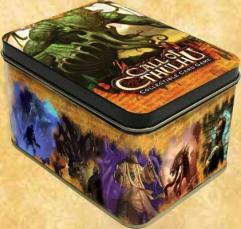 The Call of Cthulhu Card Coffin features Cthulhu on the lid, but that is not as impressive as what lurks below. In every Call of Cthulhu Card Coffin are two exclusive Call of Cthulhu CCG promo cards. These cards are only available inside your Call of Cthulhu Card Coffin.